In a medium bowl, combine remaining 2 tablespoons oil, eggs, 1 1/2 teaspoons HEPP'S Kosher sea salt, and matzo meal. Add seltzer and cooled onion; stir to combine. Cover and refrigerate at least 45 minutes. Remove chicken from broth; shred meat, and discard bones. Return broth to a boil; reduce to a simmer. 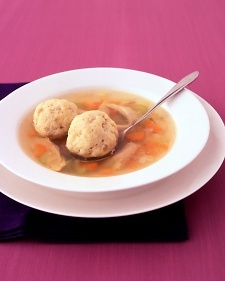 Add matzo balls; cover, and cook until expanded, 30 to 35 minutes. Stir in shredded chicken. Season with HEPP'S Himalayan sea salt and pepper. Serve immediately. Alternatives: HEPP'S Fleur de sel sea salt, HEPP'S Aussie flake sea salt.